This morning as I was leaving for work, I noticed this lone been on the back door mat. I gently scooped her up and placed her on a stack of stones. It was apparent that this little creature was cold due to the change in the weather. 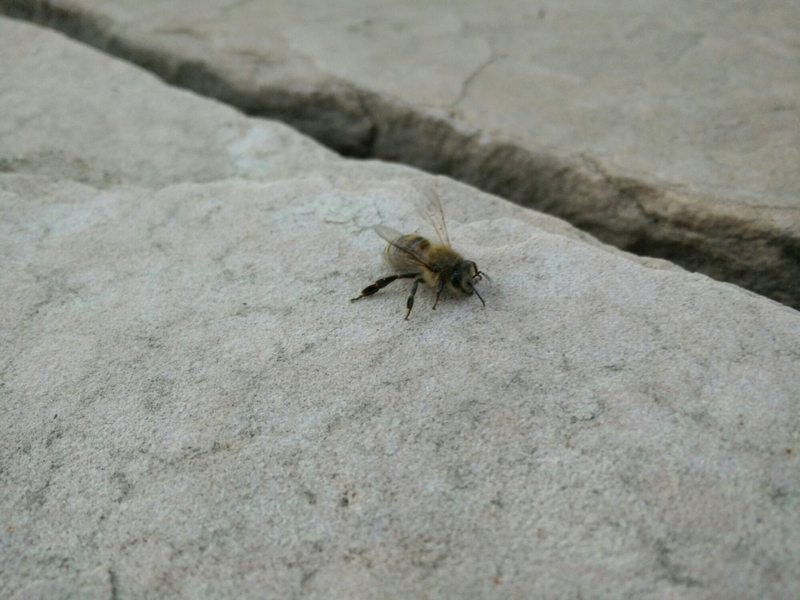 Hopefully this lone bee will warm up as the sun rises and is able to find her way back to the hive. Nice capture, Patrick! They like warm weather. I heard about rain chance in CA on TV. Hope you get some rain. Thanks, Amy! Everyone I talk to is looking forward to it raining in California, especially the fire fighters. No fires near my location but everything is very dry. Thanks, Nancy. I felt sorry for the bee considering all the problems they are having with colony collapse. Hopefully by now she is back to her hive. Just got home. Maggie and I did not find a bee corpse! Hopefully she is well.